Why go dairy, gluten and sugar free (if you don’t have to)? So what is it about dairy, gluten and sugar that has us all worked up lately? Gluten after all is a staple in most people’s diet and don’t we need dairy for strong teeth and healthy bones? And if you’re not allergic what’s the problem? Well let’s first distinguish the difference between an allergy and an intolerance or sensitivity. A food sensitivity or intolerance is not an allergy, which produces a severe (and immediate) response, such as hives, vomiting or anaphylactic shock. A food sensitivity, however, is an immune response to undigested protein molecules which enter the blood stream or lymphatic system. Gluten, casein and whey (that comes from dairy) are very common food sensitivities and eating these over a prolonged period of time can have a compounding effect leading to ill health and gut issues. Funnily enough what you crave can often be what you’re sensitive to. According to Theron Randolph, known as the father of environmental medicine and clinical ecology, approximately 90% of people have some kind of allergy or sensitivity. And 9 out of 10 of those people don’t realize that their symptoms are related to the food they’re eating on a daily basis. Have you noticed the similarity between the words “glue” and “gluten”? Its no coincidence as the term “gluten” means “glue” in Latin, and gluten is a sticky, gooey protein found mainly in wheat, barley and rye. Gluten gives the elasticity to dough and helps bread to expand and keep its swollen shape. Unfortunately it often has the same effect on our bodies too! That’s why we often feel bloated and uncomfortable after eating bread, pizza, pastries and other processed foods. Unfortunately we are misinformed and believe it is just people with Celiacs disease that can’t eat gluten, when in fact it’s estimated that 99% of people who have a problem with gluten don’t even know it. Just like I did, people often think their ill health comes from something else – not a gluten sensitivity. Just like me you’ve probably been conditioned to think that dairy in the form of milk, cheese and yogurt is needed for growth and strong bones and teeth. It was a particularly big thing for me to get over when feeding my boys, both of whom are off the growth charts and dairy free. But slashing dairy can have numerous health benefits from improving digestion to lowering your risk of some serious chronic diseases. Not to mention dropping weight fast. Cows milk, by design, grows a 90-pound calf into a 2,000 pound cow over a couple of years. Holy cow! Sounds fattening doesn’t it? That’s why most mammals only have their mother’s milk from birth and in early life to accommodate for their largest ever growth spurt. After weaning takes place no mammals drink milk…except for humans of course. Not only that, humans are the only species that then drinks milk from another species! And this is where having dairy can cause health problems. The majority of people naturally stop producing significant amounts of lactase – the enzyme needed to digest lactose (the sugar in milk) somewhere between the ages of two and five. Our bodies just weren’t made to digest milk into adulthood on such a regular basis, let alone that of a cows! The undigested lactose and the acidic nature of pasterised milk encourages the growth of bacteria in our intestines. All this contributes to a greater risk of health issues due to the acidic conditions created in our bodies. Remember dairy is not crucial for strong bones and teeth. 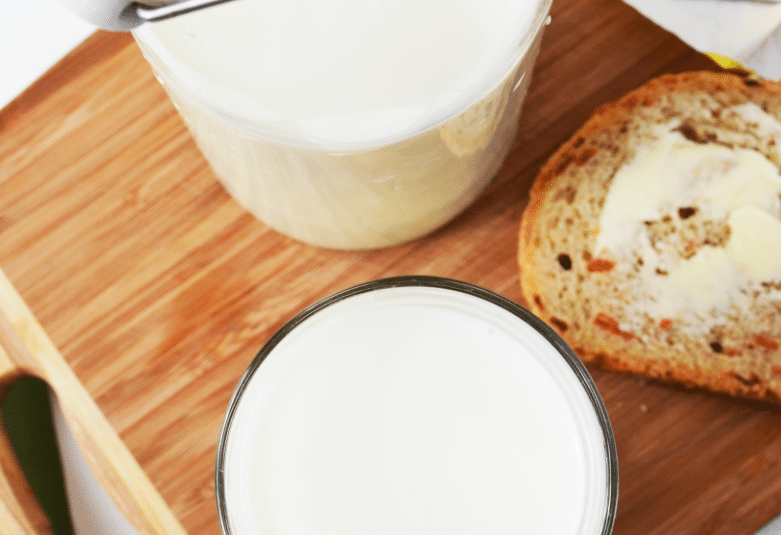 Contrary to popular belief, eating dairy products has never been shown to reduce fracture risk. In fact according to the Nurses’ Health Study dairy may increase the risk of fractures by 50%! Countries with the lowest rates of dairy and calcium consumption (like Africa and Asia) have the lowest rates of osteoporosis. Due to the high protein content of dairy, calcium can actually get leached from the body. Dairy products have also been linked to a host of other problems too, including acne, anemia, arthritis, headaches, gut issues such as IBS, joint pain, allergies, sinuses, ear infections, colic, heart disease and so on. Therefore our bodies just weren’t designed to have milk on a regular basis and despite contrary belief milk is not a reliable source of minerals. You can get much higher levels of manganese, chromium, selenium and magnesium from fruit and vegetables. A simple way to get adequate calcium is by eating dark leafy greens, like kale, collard greens, mustard greens, as well as seaweed, beans and chickpeas, broccoli, sesame seeds and raw nuts. Also sardines and salmon on the bones from tins are a great source. And don’t worry – if you have to feed your child formula. The milk in infant formula is hydrolyzed or broken down so it’s easier to digest (although it can cause allergies). Once your child is a year old or older you can then switch to almond milk and a balanced diet of food. If you haven’t seen ‘That Sugar Film’ I highly recommend you watch it. It’s a funny and very relatable documentary and a great one to watch with the rest of your family, especially your kids. Check out the movie here. Sugar is like crack, and food manufacturers know it and so they add it in everything so you’ll keep coming back. 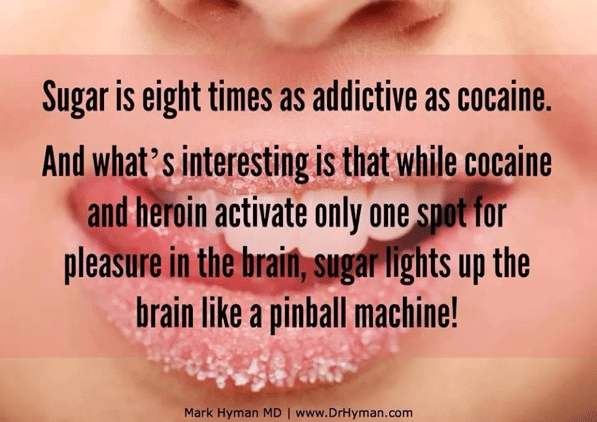 The reason sugar is so addictive is because of the impact sugar has on the reward centre of our brain. When we eat sugar, a massive amount of dopamine is released in the brain, which gives us an immediate high, but unfortunately not for long. And just like drugs the more we eat the more we need as their effect gets blunted, so the next time we will need more to get the same level of reward. Beat The Treats and my recipes and lifestyle choices are not about extreme living, fad diets and being perfect. This is a lifestyle that needs to be functional and fun and there are some great healthier alternatives to the white stuff, which I am pro using. There are numerous options but my favourites are the most readily available…good old raw honey, pure organic maple syrup and dates. Occasionally Ill have brown rice syrup, rapadura or coconut sugar. Don’t forget of course about fruit, which are to be enjoyed raw and in baking. The reason I use these alternatives is because all these natural sweeteners possess one or more of the following health benefits; enzymes, calcium, iron, potassium, protein, B vitamins, magnesium, fibre and folic acid – unlike sugar, which is an empty calorie actively depleting you of nutrients. I’m not saying you should eat naturally sweet foods three times a day, but I am saying you can have your cake and eat it. As a mum I love to have one or two nutritious treats a day and I’m good with that for me. I also love being able to provide my kids with treats that will play a part in their health and not take away from it. I’m sure this will become a passion of yours too in time if not already. I hope this article has given you some insight and encouragement to confidently try a few days or more of going dairy, gluten and refined sugar free. If you enjoyed this blog, sign up to my newsletter and never miss an update again. Ditch the junk and live deliciously. 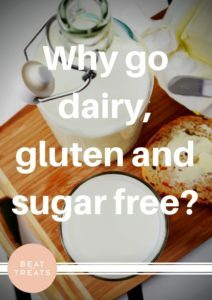 Share the post "Why go dairy, gluten and sugar free (if you don’t have to)?"